CCDA 200-310 Official Cert Guide presents you with an organized test preparation routine through the use of proven series elements and techniques. “Do I Know This Already?” quizzes open each chapter and allow you to decide how much time you need to spend on each section. Exam topic lists make referencing easy. Chapter-ending Exam Preparation Tasks help you drill on key concepts you must know thoroughly. Your downloadable Pearson IT Certification Practice Test engine allows you to focus on individual topic areas or take a complete, timed exam. The assessment engine also tracks your performance and provides feedback on a module-by-module basis, laying out a complete assessment of your knowledge to help you focus your study where it is needed most. 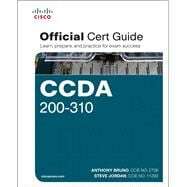 CCDA 200-310 Official Cert Guide is part of a recommended learning path from Cisco that includes simulation and hands-on training from authorized Cisco Learning Partners and self-study products from Cisco Press. To find out more about instructor-led training, e-learning, and hands-on instruction offered by authorized Cisco Learning Partners worldwide, please visit http://www.cisco.com/web/learning/index.html. The print edition of the CCDA 200-310 Official Cert Guide contains two free, complete practice exams. Also available from Cisco Press for Cisco CCDA study is the CCDA 200-310 Official Cert Guide Premium Edition eBook and Practice Test. This digital-only certification preparation product combines an eBook with enhanced Pearson IT Certification Practice Test. Anthony Bruno, CCIE No. 2738, is a Consulting Director with BT with more than 20 years of experience in the internetworking field. Previously, he worked for International Network Services, Lucent Technologies, and as a captain in the U.S. Air Force. His other industry certifications include CCDP, PMP, CCNP Security, Cisco Certified Business Value Practitioner, Cisco Data Center Network Infrastructure Specialist, Cisco Security Solutions & Design Specialist, and ITILv3 Foundation. He has consulted for many enterprise and service provider customers in the design, implementation, and optimization of large-scale networks. Anthony leads architecture and design teams in building nextgeneration networks for his customers. He completed his Master of Science in Electrical Engineering at the University of Missouri—Rolla in 1994 and his Bachelor of Science in Electrical Engineering at the University of Puerto Rico—Mayaguez in 1990. He is also a part-time instructor for the University of Phoenix—Online, teaching networking courses. Outside of work Anthony enjoys running marathons, Spartan obstacle races, and Olympic and Ironman distance triathlons. along with working at several Cisco Gold Partners. He has extensive experience in data center architecture and design and has implemented solutions in many financial, energy, retail, healthcare, education, and telecommunications industries. Steve is a 10-Year triple CCIE in the tracks of Routing & Switching, Storage Networking, and Data Center. His other certifications include VMware VCIX-NV, VCP-NV, VCP4-DCV, VCP5-DCV, CCDP, CCNP, ACI-SE, and ACI-FE. Steve was also the coauthor for the previous editions of the CCDA Official Cert Guide.